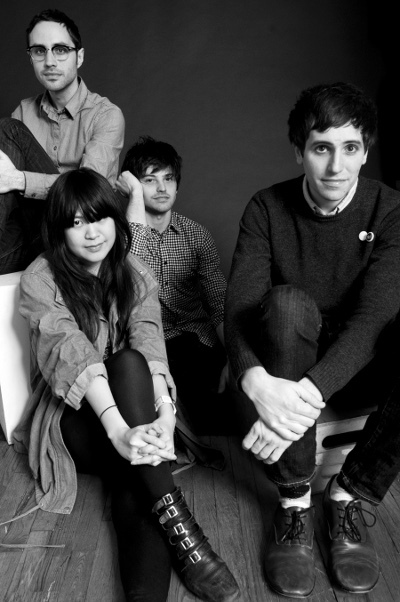 The Pains of Being Pure At Heart are a New York four piece who came together in 2007 and have released their first album earlier this year. Some have called it Noise-Pop, in the tradition of people such as My Bloody Valentine but that doesn't tell the full story at all as our podcast for this month, Higher Than The Stars, shows. You released your first album earlier this year. Was it obvious to you that the time was ripe?! Kip: We didn't have any expectations when we released it. Most of the bands we were inspired by weren't very commercially successful when they were around, so we just figured only a handful of people would like it-- if we were lucky. But we were fine with that, because those were the sorts of bands we liked growing up. Have you done anything different in it from what you were doing before you started it? Kip: Do you mean is our music changing? Yes, and we're excited by that. We just try to write the best pop songs we can, and not writing the same sounding songs over and over again. I think it's fun to try new things, and I always admire bands that are willing to do that. Deerhunter/Atlas Sound is an example of a band that seems really adventurous, and also consistently pretty awesome. How did you get started together? Kip: We were all friends who were pretty nerdy about the same kinds of music-- noisy pop. Playing music together was fun, because even if we weren't that technically good, we loved doing it so much. Kip: I think we were really into early My Bloody Valentine, The Pastels, Exploding Hearts, Yo la Tengo, Teenage Fanclub and things like that. Those bands come from different places, but they were all wrote some amazing pop songst. We also liked contemporary New York bands like Crystal Stilts, caUSE co-MOTION and Vivian Girls. I remember going to those shows a lot before we formed, or maybe when we were just starting out and feeling pretty in awe of the different, but awesome things those bands were doing. Do you think New York has any kind of influence in a specific kind of way? Kip: We love New York, especially it's musical history. Bands like The Ramones and Blondie are really inspirational. The lushness of your songs seems not a very New York thing (but we might have led sheltered lives). Where does that come from? Kip: The Suburbs. We've also led sheltered lives. Do you have any philosophical take on your own band name? You're working quite hard at the moment playing a lot of dates. Do you find you're being well accepted where ever you go? Kip: People have been really supportive and awesome-- it's amazing to show up somewhere we've never been before and see people singing along to our songs. It's a very wonderful feeling. What have you got coming up that's exciting you? Kip: We're releasing a new EP with four new songs on Slumberland (us) and Fortuna Pop (uk/eu) called Higher Than the Stars.